Enjoy horseback riding at Koli Equestrian Center, located in the heart of the Gila River Indian Reservation and adjacent to The Sheraton Grand at Wild Horse Pass. We are located on the west side of the hotel, which is directly behind it. We have several group horseback trailriding times or you can reserve a private horseback trailride for any time. We look forward to out of town guests, as well as our local communities. 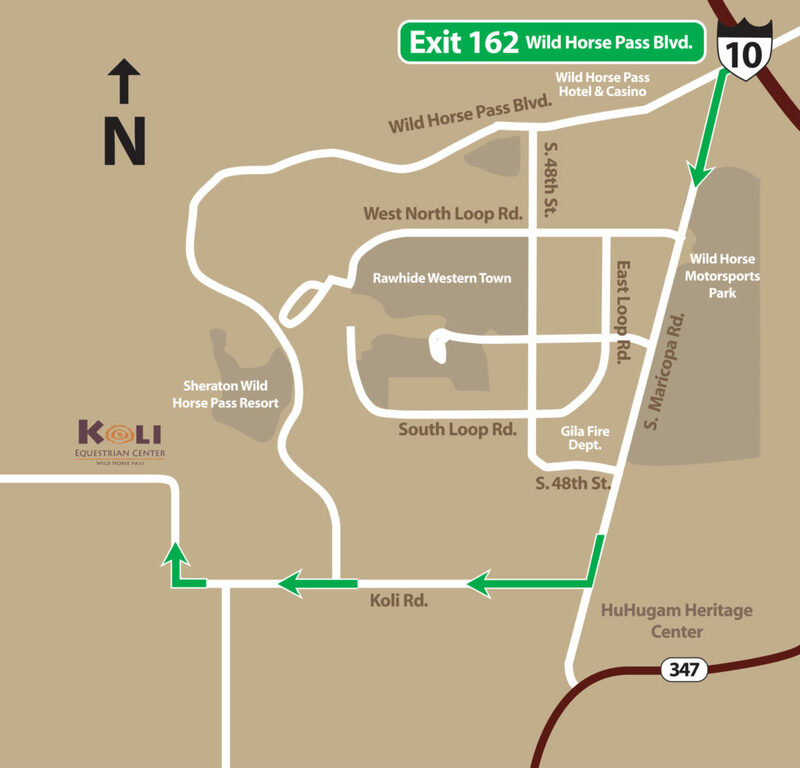 You can find us on Google Maps or MapQuest by entering KOLI Equestrian Center instead of our address (being on the reservation the address takes you to where the mail box is and not our physical location). Take I-10 to exit 162, which is Wild Horse Pass Blvd. Head west to first traffic light which will be Maricopa Rd (to the left is a Chevron Gas Station and to the right is the entry to the Wild Horse Pass Casino & Hotel). Make left turn onto Maricopa Road and head 1.5 miles. You will pass the Gila River Fire Department, which will be on your right. Just a little further you will see Koli Rd Street Sign on the right. Make a right turn at Koli Rd (cannot turn left) and head to the very end of the road. You will go approx 1.5 miles where the road makes a sharp right turn. Follow that around and when you get to the stop sign you will see us in front of you. If you get lost, no worries, just give us a call at 602-796-3495.We look forward to your horseback trail ride and seeing you soon.